I'm hungry, what's for lunch? Recently Mr. K and I were invited to a Dutch-Indonesian feast known as Rijsttafel, which is Dutch for rice table. The rice table was introduced during colonial times where lines of servants or sarong-clad waitresses ceremoniously served the marathon meal on platters laden with steaming bowls of fragrant foods. During their 350-year occupation of Indonesia, the Dutch would impress visitors with the exotic abundance of their colony. Apparently the rice table has virtually disappeared from restaurants in Indonesia but the tradition of Rijsttafel has spread throughout the world. We pulled into one of the many sprawling parking lots that surround an endless archipelago of strip malls along Crow Canyon in San Ramon. We were going to a pop-up rice table that was being served at Ruggies, an old school style diner which is normally only open for breakfast and lunch. 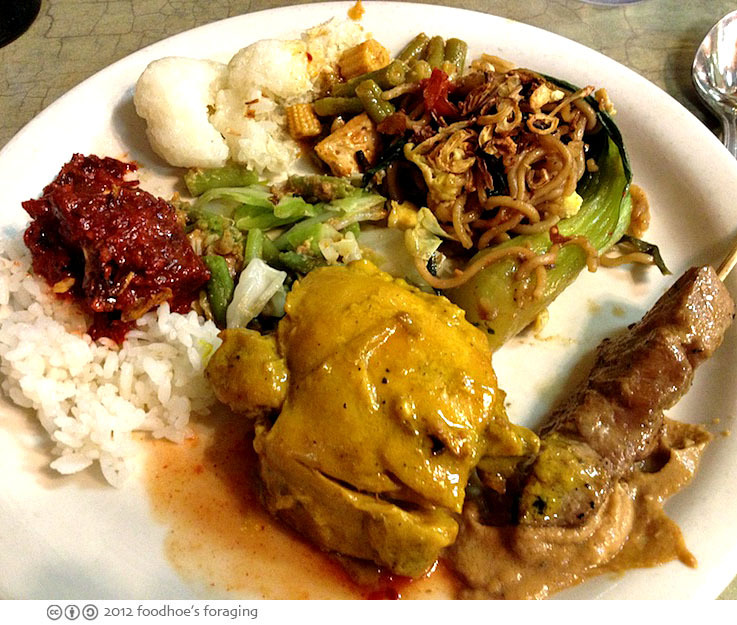 The owner’s family has Indo-Dutch roots and welcomed us to join them in makan-makan, Malay for eating a meal. We were introduced to the unexplored cuisine from the Spice Islands, with many influences from the surrounding countries of the middle east, India, China, and Europe. 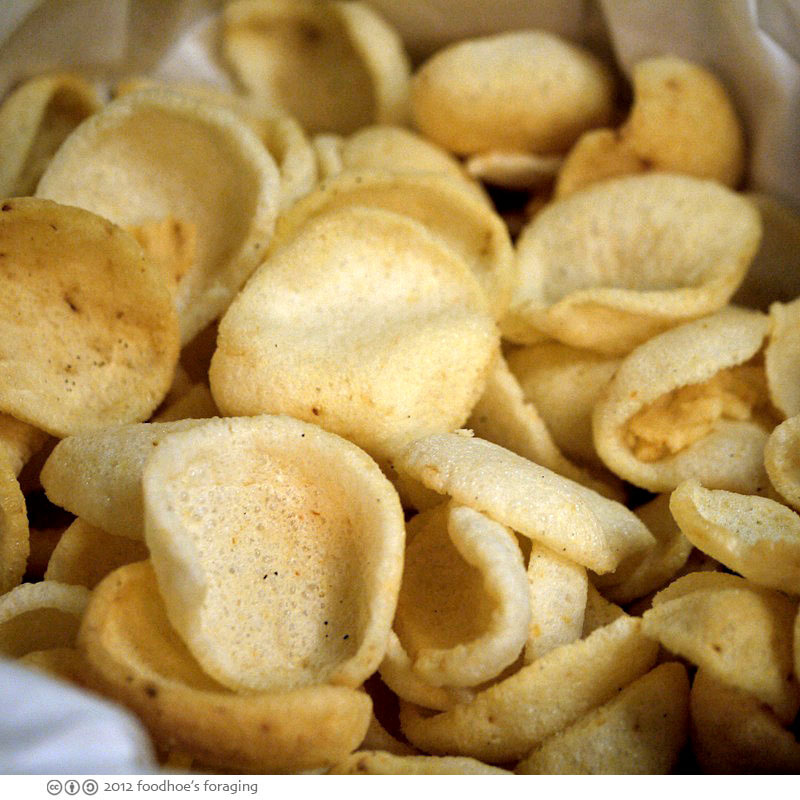 I totally love Shrimp Chips, and dove into the basket with abandon. The cloudlike chips were savory with a satisfying starchy crunch. Over the years I have developed a bad habit of sticking them on my tongue because I like the way they stick to it. There were Fried Wontons, which I haven’t had in a long time. 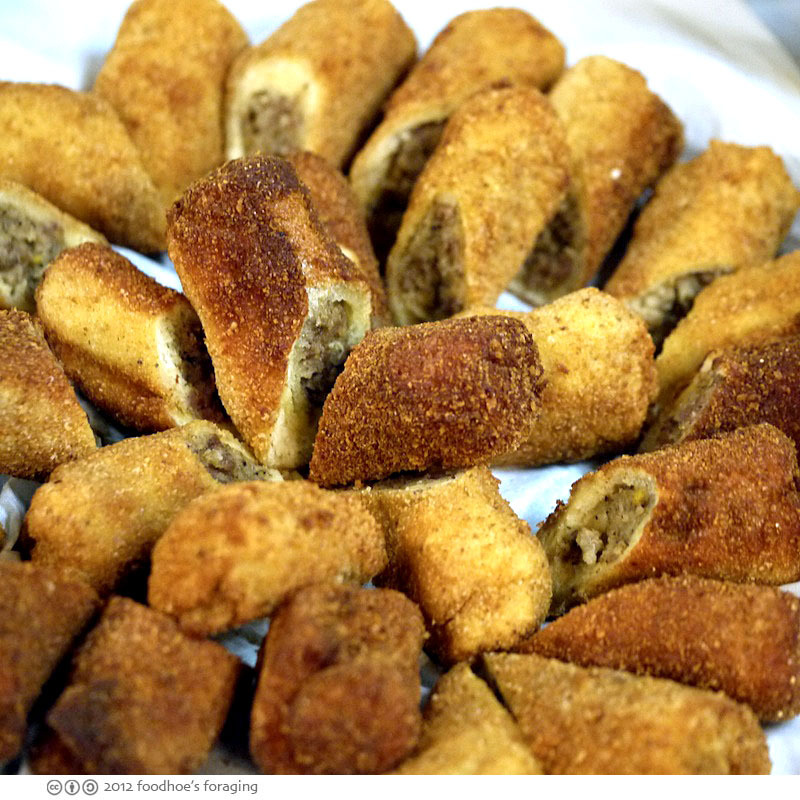 They were full of wonderful textures, crunchy, crisp and chewy from the fried wrapper surrounding the savory filling. There were numerous bowls of condiments, in the foreground is a bowl of dried shredded something, the red stuff that looks like cranberry sauce is spicy sambal, fried shallots, and the most delicious peanut sauce that was sweet savory and a little spicy. Next I tackled the mountain of Lumpia which had thick wrappers which seemed to have been breaded and were filled with ground meat, vegetables and thin vermicelli noodles. There were two huge platters of Gado Gado, a vegetarian dish composed of potato chunks, cucumber, tofu and beansprouts tossed with a flavorful peanut sauce and especially good topped with fried shallots, some of the shrimp chips and any manner of combination of the other condiments provided. 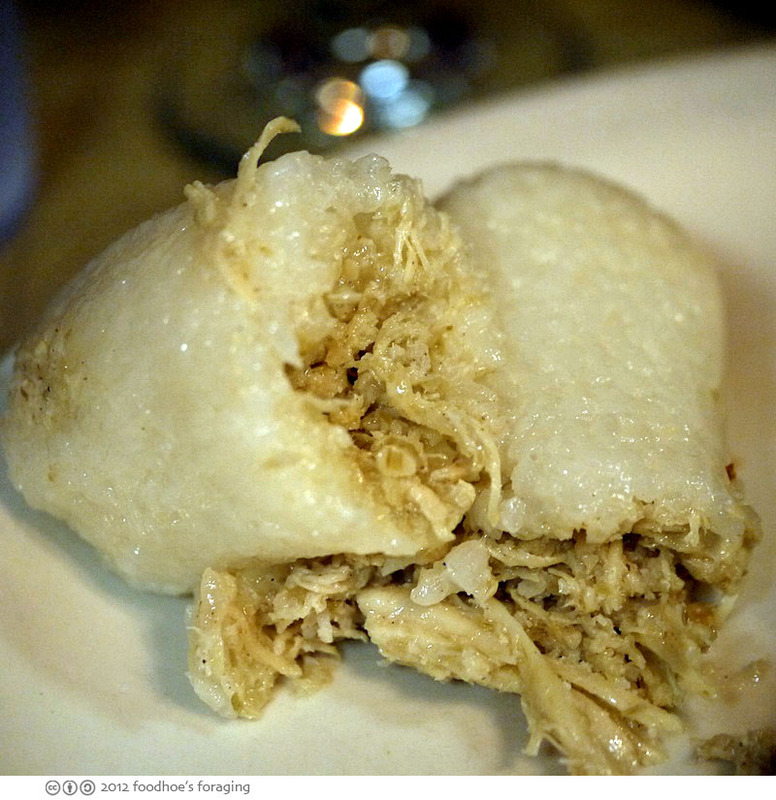 The Lemper Ayam were a delicious treat, a sticky rice roll that is filled with shredded chicken. They looked like tamales in plastic wrap, but instead of corn masa, they are made with sweet rice which is rich in starch, even more so than the Japanese rice that is used for sushi and is very soft and sticky. The filling was tender and perfumed with the aromatic flavors of lemongrass and even though I grabbed the last one and said I would share with Mr. K, I greedily wolfed most of it down. 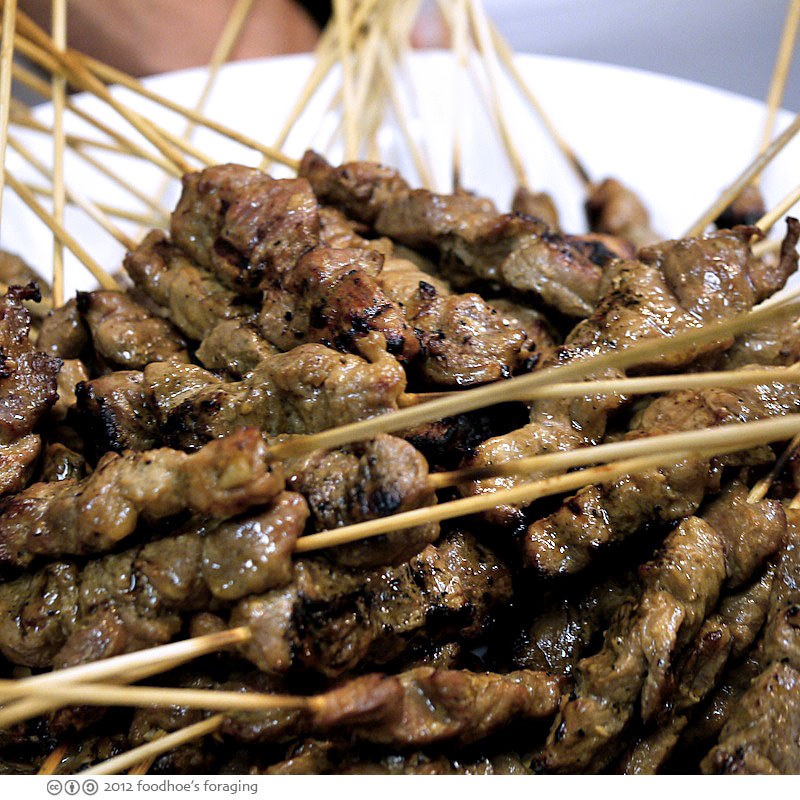 The Beef Satay was excellent, tender and juicy and had a marvelous charred flavor from the grill, spiced with cumin and coriander. 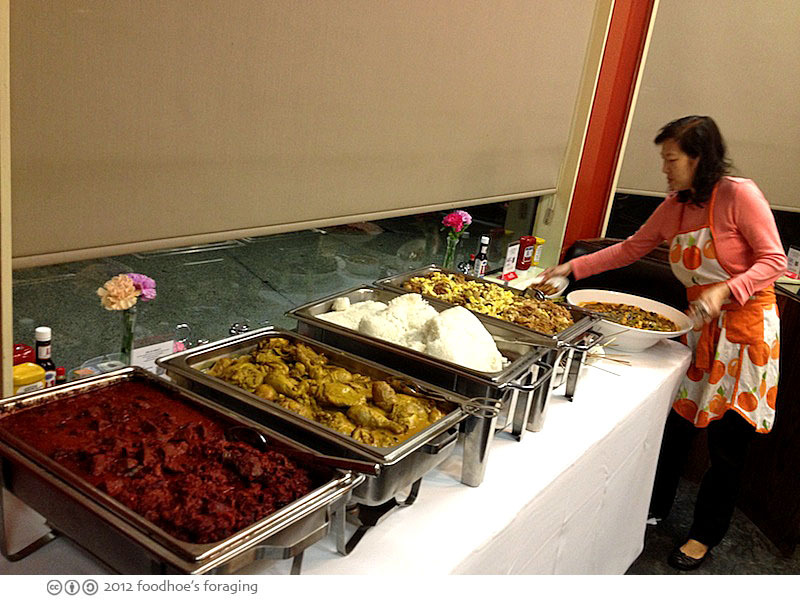 The food was all prepared by Marianna, a caterer who is a friend of the owner. Here she is supervising the arrangement of steaming vats filled with the delicious looking main entrees. Yes, after totally stuffing ourselves on the plates of snacks, we were ready to start the dinner course! 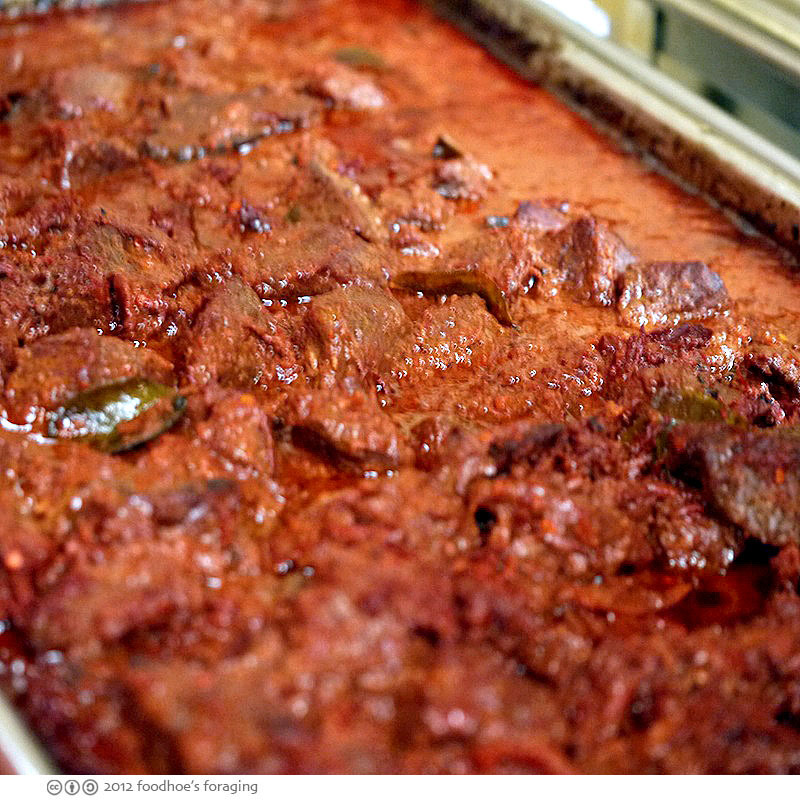 Beef Rendang is one of the most famous dishes of Indonesia, aromatic spicy caramelized beef that has been braised slowly in coconut milk, and infused with chili and spices. 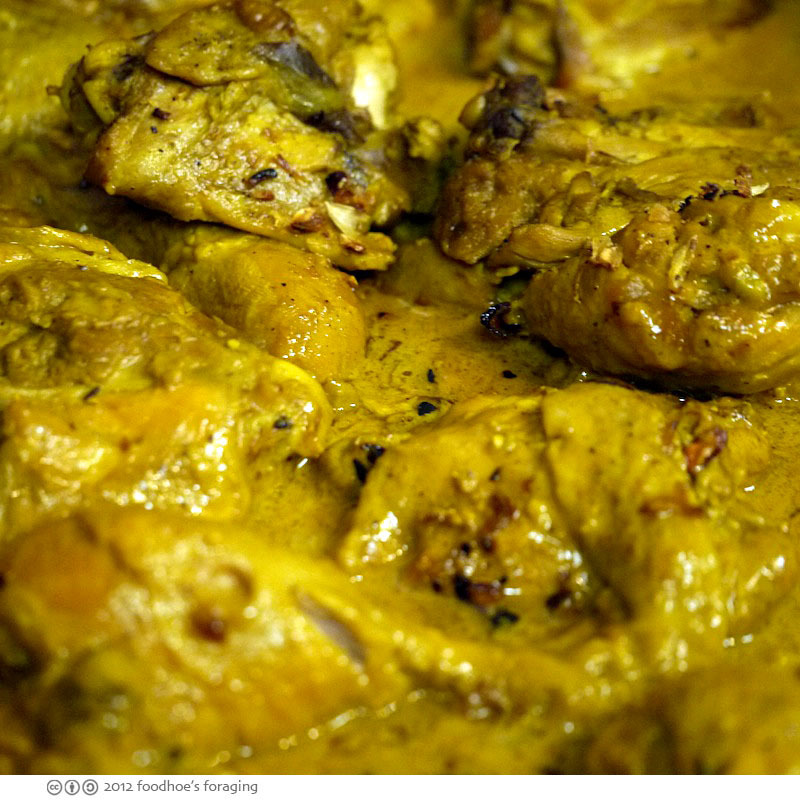 The flavors were remarkable and aromatic, Mr. K kept raving about how much he loved this dish. 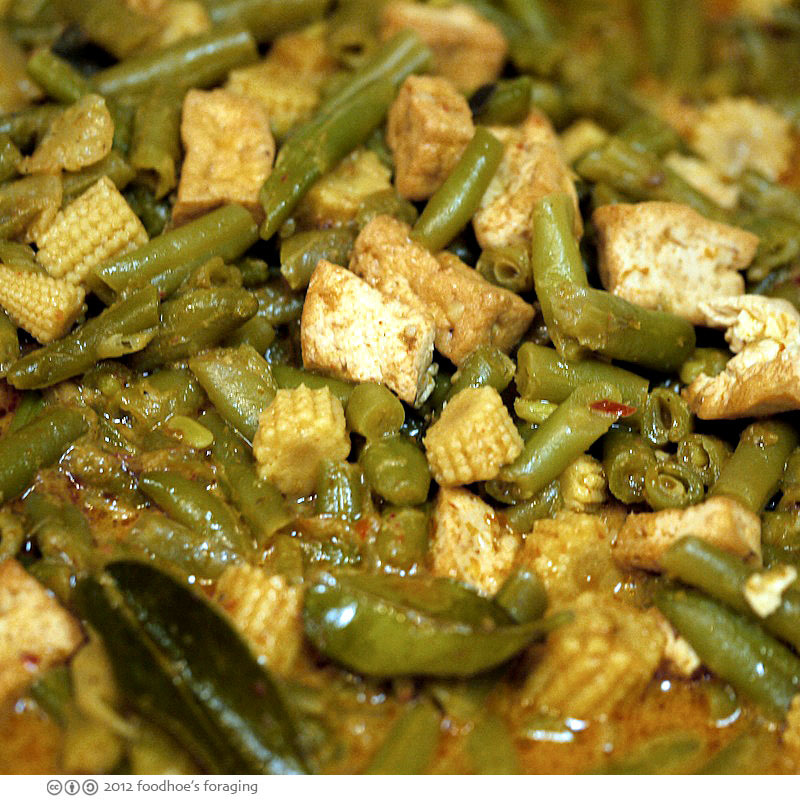 A lovely Curry made with green beans, tofu and baby corn, with the added richness of coconut milk, it was mild and soothing and so good on the plain steamed rice. 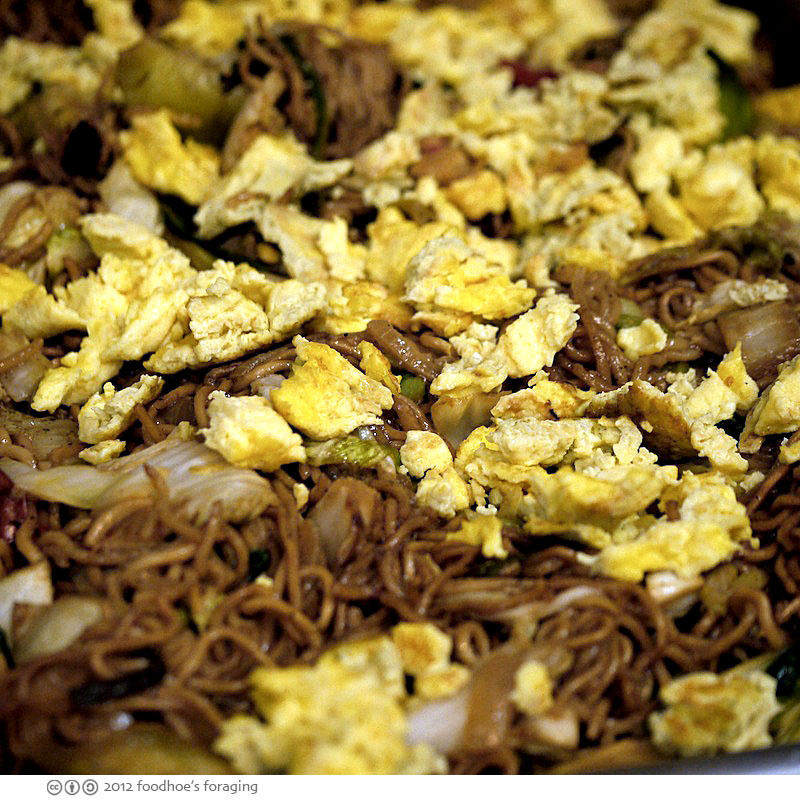 The Javanese Fried Noodles were an addicting blend of thin chewy noodles tossed with scrambled egg and vegetables, it was a hybrid of the flavors of chow mein and the smoky wok seared Thai dish Pad See Ewe that I love, I couldn’t get enough of these! For dessert we were served Biji Salak, a compote of sweet potato dumplings floating in sweet palm syrup served in a parfait glass. 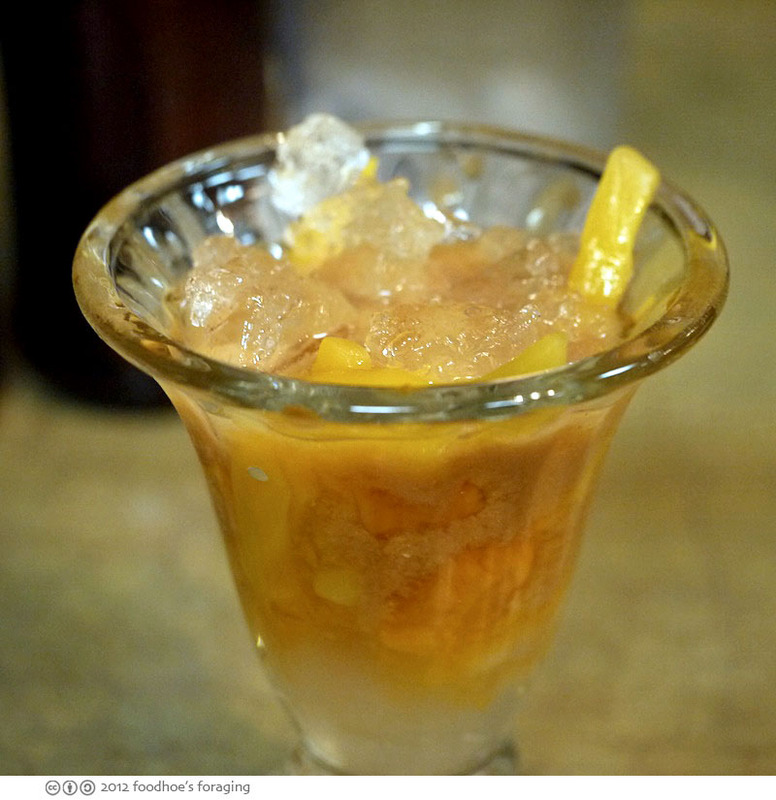 There were chewy tapioca pearls at the bottom suspended in an even sweeter substance that I really liked and topped with refreshing chunks of ice and twig shaped sticks of fruit. 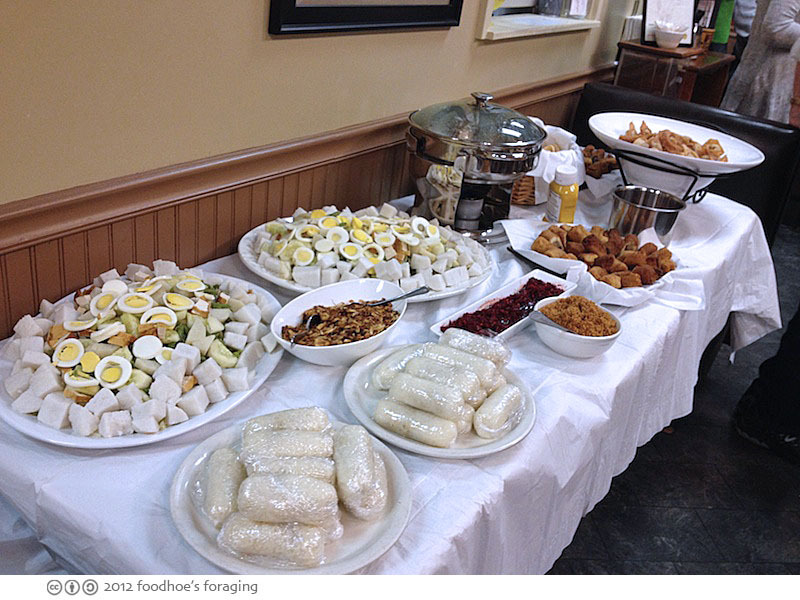 It was an epic meal where we were treated to many different delicious taste sensations and flavors. 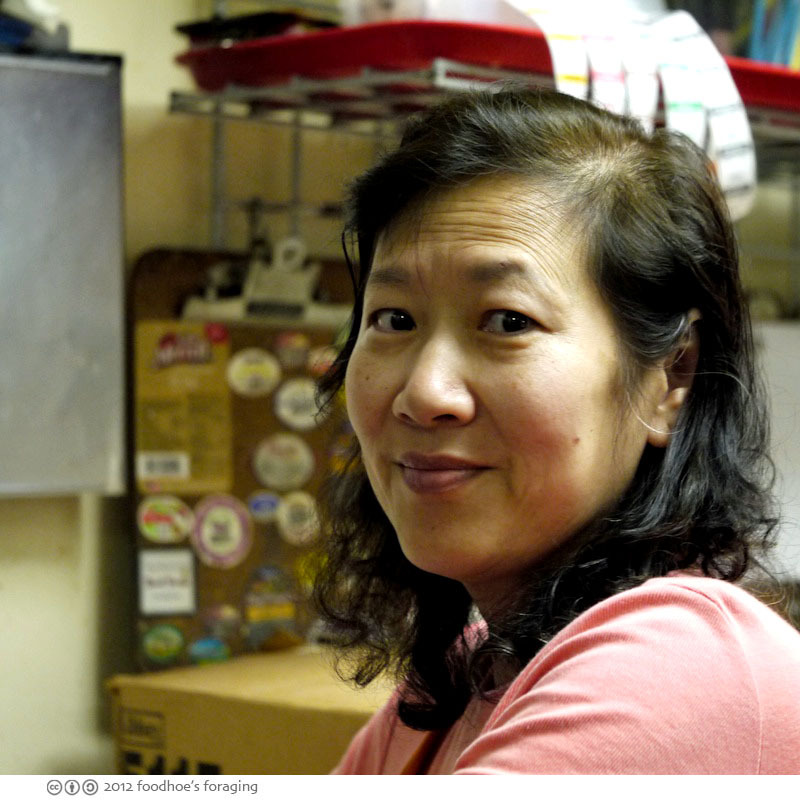 It definitely made me want to try more of the flavors of Dutch-Indonesian cuisine… Many thanks to the owner of Ruggies for hosting this and best wishes to Marianna who is a most excellent chef! Oh, lucky you! That food looks amazing. Rosa, it was amazing and yes I feel lucky I was able to enjoy it! I was there! It was yummy!!! The Lemper Ayam was to die for! Hi Liz, I know I’m still drooling over all the pictures. It was fun to hang out with you while enjoying such a delicious feast! How were you so fortunate to get an invite? Do they plan to do it again because my husband and I’d love to go. 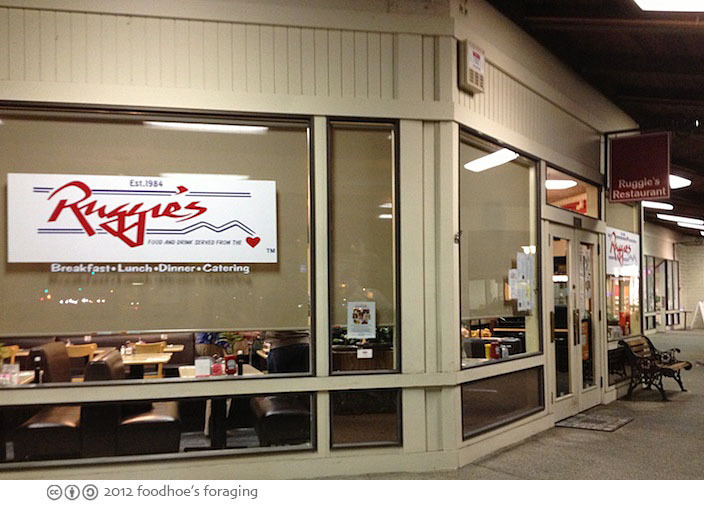 Ruggie’s is only 3 miles from my home. It all looks so delicious. I enjoy reading about all the places you go to. Only wish that we could afford to eat out more often. Hi Debbie C, Thanks for visiting and your comments. Mr K (the hubs) works with someone affiliated with the owners, who knows we love to eat… This was a maiden flight so to speak, I think they wanted to test out the waters and it seemed like a big success to me! I’ll keep you posted if I hear about another one for sure. Next post: ReWinery Wine + Cheese = A Fondue Party!